So we've all packed away the pumpkins and put Halloween to rest in peace for another year, so let's pull out all the stops and just accept that Christmas is on its way. Yes okay, it is a bit early for me too, but when items sound as interesting as this one you will have to forgive me for the odd early review. 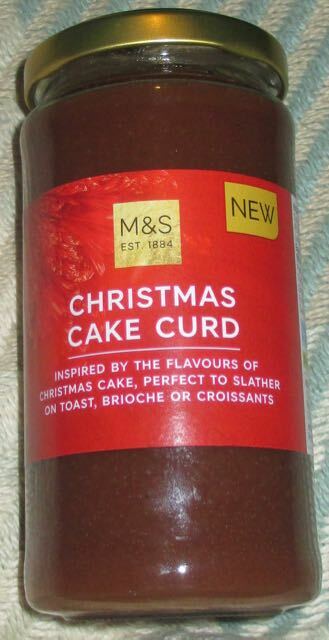 Marks and Spencer have brought out Christmas Cake Curd. Now there have been quite few biscuit flavour spreads coming out and now that I'm used to spreading Custard Cream on my toast I didn't think there would be much that could surprise me. Christmas cake on toast is definitely new though and I couldn't wait to try it. 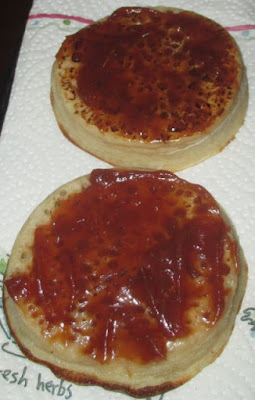 As I popped a couple of crumpets in the toaster I pondered that classic jam / spread query, butter or no butter. I always put butter under a jam but not under a chocolate spread or a biscuit spread so I decided to go without the additional layer. I opened up the jam and inhaled the aroma of warm and fragrant spices, which reminded me a bit of hot cross buns, but with a heavy fruity undertone. The curd was like a jam in texture, smooth, light and quite soft and silky to spread, this meant I probably should have gone with the butter route but it gave it a purer base to test it on without. It was also a dark red colour making it more jam like in that respect too. Now the flavour was interesting, it had a hint of Christmas cake about it, but the balance wasn't quite there to be exactly the right taste. To be fair this comes down to the seasoning balance and perhaps some cakes are quite heavily seasoned with Christmas spice, but this one seemed heavy on flavours like clove and nutmeg. The base taste was that of a rich raisin, which worked well. The flavour was sweet but not overly so, and there was an aftertaste of sour from the fruit. I liked the warming spiced mixture, it's a nice idea and certainly a fab novelty for the Christmas season. It will be a big hit if you like raisins too. Not sure it will be that greatly missed in the new year that I'd be stocking up, but who knows by then Marks and Spencer might be releasing Hot Cross Bun curd? I tried to find this today to no avail, but I did spot lots of lovely sounding christmassy goodies. I'll have to keep searching- this sounds too good to miss out on! I found this curd yesterday. I tried it this morning on toasted Vogel bread and nearly cried with nostalgia. This joy had nothing to do with Christmas cake though. The flavour (not the creamy texture) reminded me so much of apple butter, which is a treat for toast in America. I headed straight back to M & S today and bought more. They had it on sale 2 for the price of 3. If you can still get a jar consider yourself lucky. I thought the flavours were Christmas like, if not Christmas cake like. Yummy!